The Association of Southeast Nation States (ASEAN) is designing a multilateral energy distribution infrastructure ideally-suited for interconnection with a Pan-Asian Energy Infrastructure. The two key existing projects in Southeast Asia are the Trans-ASEAN Gas Pipeline (TAGP) and Trans-ASEAN Electricity Grid (TAEG). Together, they are the most ambitious energy interconnection projects outside the European Union aimed at deepening multilateral energy market integration. The TAGP and TAEG could become the nucleus of a concentrically-expanding Asian electricity and natural gas system that fans out northward to China and southward to Australia. As ASEAN deepens integration its own infrastructure, the 10-nation group can liaise with the other major trading parties (China, Japan, South Korea and Australia) in a Pan-Asian Energy Infrastructure. This would make multilateral decision making easier because only five national or supranational entities would need to negotiate. It would also immensely increase ASEAN’s geopolitical heft. The TAGP/TAEG projects are not the only big infrastructure planned for Southeast Asia. Indonesia, Malaysia and the Mekong States all are planning domestic infrastructure projects that fit well into a Pan-Asian Energy Infrastructure. These include the proposed subsea Distinct Objective Berhad LNG pipeline between Malaysia and South Korea, the proposed construction of HVDC power lines between peninsular Malaysia and Borneo and efforts by the Mekong States to develop additional hydro power projects. Proposed additions to the region’s telecommunications capacity also offer an ideal example of the potential interlocking synergies. Australia is building a National Broadband Network. Indonesia is planning its Palapa Ring project to connect its archipelago with modern communications. A multi-country Southeast-Asia Japan Cable is planned. China is wiring its major cities with fiber optic. The telecommunications industry is decades ahead of the energy industry in pursuing interconnection opportunities. 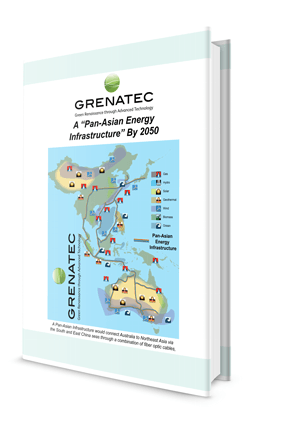 It offers a template for a Pan-Asian Energy Infrastructure to follow. In fact, there are diseconomies in not doing so. Australia’s US$40 billion National Broadband Network illustrates this. Its utility to end-users will be negated if international high-speed connections can’t keep pace. Deepening international fiber optic data connections between Australia and the rest of the world will enable Australia to get maximum value for its maximum-cost NBN. Equally important is the economic value of bundling natural gas pipelines and electricity power lines with fiber interconnections. All this creates interlocking, cost-reducing efficiencies through increased trade. For instance, hydrogen can — even today — flow through existing natural gas pipelines alongside gas. Over time, other future fuels almost certainly will be developed. These will need a pipeline network and will be unsuitable for shipment in Liquid Natural Gas infrastructure. Given the above, Asia should be thinking of the long term. If it does, it will gravitate toward multipurpose energy delivery infrastructures instead of single-generation, single-purpose infrastructures such as LNG. All up, Southeast Asia — like the European Union — has the opportunity to show the rest of the world the way toward deeper multilateral energy market interconnections and the benefits it can bring. Without East Timor, a Pan-Asian Energy Infrastructure is a non-starter. As southeast Asia’s poorest nation, East Timor will rely heavily for decades to come upon gas revenue from the Sunrise field and transit fees from a Pan-Asian Energy Infrastructure. Absent those, East Timor could well become a failed state. A Pan-Asian Energy Infrastructure would come aground along East Timor’s southern coast. For its part, East Timor favors building an LNG plant in the south coast town of Beacu. East Timor argues that this will foster economic development and create jobs. But a bundled HVDC/pipeline/fiber optic system would almost certainly generate more benefits for East Timor than a single-purpose LNG plant staffed by expatriates. If a bundled pipeline/HVDC/fiber system came ashore at Beacu, it could then cross the roughly 65-kilometer wide island to spur off to the capital of Dili and across the island to the West Timor capital of Kupang and onward to eastern archipelagic Indonesia. Along the way it would expand electrification and tele-density rates in the country, now among the lowest in the world. It would also provide gas for local electricity generation. This would create more reliable power supplies, sparking a virtuous circle of national economic development. East Timor is currently building Chinese power plants to meet its electricity needs. These are environmentally-unfriendly. Cleaner, safer energy sources would help the small nation immensely. When East Timor became independent from Indonesia in 1999, much of East Timor’s infrastructure was destroyed by departing pro-Indonesia gangs. East Timor and Indonesia now have full diplomatic relations, but East Timor’s infrastructure still remains woefully inadequate. Indonesia is now laying fiber optic cable across its Eastern archipelago all the way to West Papua under a project known as Palapa Ring. Indonesia wants to extend the fiber down to East and West Timor, and possibly as far as Darwin. Palapa Ring is an example of how mutually-beneficial infrastructure between Australia and Asia can overlap at the periphery, creating opportunities for everyone to gain if they coordinate. Since East Timor’s independence, Australian aid programs for East Timor have shown poor results. Given this, the Australian government now believes building infrastructure in East Timor may be the most efficient way to encourage economic development and political stability in East Timor, which in turn helps secure Australia’s northern frontier. If a Pan-Asian Energy Infrastructure crossed East Timor from south to north, East Timor could draw off natural gas from its share of the Sunrise gas field. East Timor could then generate domestic electricity from this gas. Or East Timor could just draw off the more finished product of electricity transiting the country via HVDC — netting those purchases off with sales of its Sunrise field gas. Or it could do a combination of both. From the capital Dili, a Pan-Asian Energy Infrastructure would head north across the Savu Sea to the island of Atauro where it would then head west to the island of Alor. The route would include a dog-leg of two 33-kilometer stretches across the Savu Sea, one going Northeast from Dili across an 11-kilometer oceanic trench that’s 2,000 meters deep at one point before turning west for a 33-kilometer run to Alor. Doing things this way would avoid depths of up to 3,000 meters further west. It also would put the bundled infrastructure to the east of major earthquake faults. From Atauro to Alor, the waters are generally less than 1,500 meters deep. Australia and Asia have everything to gain from a politically-stable, economically-growing East Timor. As part owner of significant Timor Sea energy assets, East Timor is undeniably a future player in Asia’s energy markets. Like Papua-New Guinea, another poor state on Australia’s northern perimeter, instability can create huge problems for Australia. Increasing prosperity in the two nations can help ensure stability. Providing energy infrastructure to East Timor is a key element of this, the Timorese believe. Helpfully, East Timor has warm relations with former occupier Indonesia, which is now formally supporting East Timor’s effort to join the Association of Southeast Asian Nations. However, as in Papua-New Guinea, China is seeking commercial influence in East Timor. It’s reasonable to believe that China’s interests don’t stop at the purely commercial. For instance, leaked US diplomatic cables have indicated – there, a request East Timor denied. Indonesia is a linchpin country in a Pan-Asian Energy Infrastructure. It’s also a potential consumer and producer of renewable energy within a Pan-Asian Energy Infrastructure. It has a lot to gain from expanded regional infrastructure. Indonesia is Southeast Asia’s largest economy. It’s also the world’s fourth-largest greenhouse gas emitter. Indonesia has one of the region’s lowest rates of rural electrification. It suffers from massive poverty. Indonesia is a heavy coal user. Indonesia is running out of oil. If Indonesia makes the switch to renewable energy, it could pay huge dividends to the domestic economy. Indonesia has huge renewable energy resources. Geothermal is the biggest. But Indonesia also has hydro and micro-hydro resources, biomass and even exotic energy resources like tidal and ocean thermal energy it might one day tap. Hydro is Indonesia’s largest renewable energy source. It’s been estimated at about 75,000MW — multiples of Indonesia’s current electricity consumption. At present, Indonesia has about 4,000MW of large-scale hydro, an amount it aims to increase by 25% between now and 2014. In addition, Indonesia is encouraging deployment of mini- and micro-hydro projects that could total about 45MW over the same period. Micro-hydro can provide energy solutions for economically-underdeveloped regions such as Kalimantan and the eastern archipelago. In both places, the electrification rate is below Indonesia’s national average of about 65%, itself one of the lowest in Asia. Indonesia has as much as 27,000MW of potentially-developable geothermal resources. That’s twice Indonesia’s current electricity consumption. If Indonesia developed all its geothermal resources, it could power both itself and Malaysia in full. To date, however, only about four percent, or 1,050 MWs, of Indonesia’s geothermal potential has been developed. Roughly half of Indonesia’s geothermal potential lies on the island of Sumatra, with about another one-third located on the islands of Java and Bali. About five percent of Indonesia’s geothermal energy is found on the island of Sulawesi with the rest spread about the other islands, for instance Flores. Indonesia aims to quadruple the geothermal energy feeding into its grid by 2014, and get a total of 9,000 MW of capacity online by 2025. This implies a compound annual growth rate of 24%. Some promising deals have been signed in Indonesia’s geothermal industry. But without more aggressive action, it’s unclear whether the target can be met. Like other Southeast Asian nations, Indonesia has a lot of agricultural waste that could be used for biomass power, much like Australia’s Queensland does. Algal biofuels also hold great promise. With Indonesia’s long coastline, equatorial warmth and strong sunshine, the country could become a pioneer in various algal-based fuels. This kind of biomass oriented development could dovetail nicely with efforts to better protect the nation’s forest cover as part of deals such as the $1 billion Indonesia agreed with Norway to protect Indonesia’s tropical forests. Indonesia also plans to build out small-scale solar, particularly in tourist regions to its east which have few other energy sources. These are expected to add roughly 2,200 MW to the grid. However, despite the absolute number being small, the benefit of small-scale solar to Indonesia is proportionately greater since many of these installations will be for locations which previously had no electricity. As an archipelagic country, Indonesia also has the potential to develop wave and tidal energy. In early 2011, Indonesian Vice President Boediono visited Australian wave energy companies to talk up the potential, since Indonesia is planning a tidal plant on the island of Riau, near Singapore. A Pan-Asian Energy Infrastructure would have to cross both the Timor Sea and the Savu Sea enroute to Indonesia. In addition to offering opportunities to develop longer term exotic power sources like Ocean Thermal Energy Conversion (OTEC), Indonesia’s existing energy projects could serve as a springboard for research and development of OTEC. One example is Chevron’s 2,000-meter deep natural gas development off Kalimantan. This project could offer an opportunity to test, refine and develop the potential for OTEC in the deep waters off Kalimantan, the Philippines, the South China Sea and the island of Timor. Indonesia’s national grid ends its eastward expansion on the island of Bali. The islands to the east of Bali are separated from the national grid. As it happens, they are also the poorest regions of Indonesia. An HVDC infrastructure, particularly if coupled with other infrastructure in the region, such as fiber optic cables, could spur economic development in these island provinces and provide a pathway for Australian renewable energy to reach Asian markets. A Pan-Asian Energy Infrastructure would enter Indonesia on Alor Island after traversing the Savu Sea from East Timor. Once ashore on Alor, the system would hopscotch across the island chain to Bali for interconnection to Indonesia’s existing grid. Separately, the system could traverse the island chain until it reaches the shallower depths of the South China Sea. There, it could turn north across the sea bottom to the Indonesian island of Natuna en route to Guangdong in southern China. A land-based infrastructure would be cheaper. It could make use of existing terrestrial pathways for electricity and natural gas pipelines across Java, Sumatra, peninsular Malaysia, Thailand and Laos en route to interconnection to China’s grid. A sea-based system would cross only shallow water, and could provide interconnection to a series of natural gas projects underway and planned for the region. It would also take a much shorter and direct route to the big energy consumption markets of North Asia (China, Taiwan, Japan and South Korea). The South China Sea is already heavily crisscrossed with natural gas pipelines and fiber optic cables, and some HVDC projects have been proposed. As a result, the benthic environment is very well known. Tectonic risk is negligible. As part of ASEAN’s Trans-ASEAN Gas Pipeline and Trans-ASEAN Electricity Grid, new gas pipelines between Java and Kalimantan (ie the eastern half of Borneo) are proposed, as well as deepened electricity interconnections between Sumatra and Malaysia. The Trans-ASEAN Electricity Grid will help Indonesia expand and upgrade its electricity network with the help of multilateral institutions like the Asian Development Bank. The Trans-ASEAN Gas Pipeline will help Indonesia develop coal seam methane resources in Indonesian Kalimantan. If developed, these new energy sources will need a route to market. As Indonesian incomes rise due to economic reforms and reduced corruption, rising living standards can be expected to create greater social pressure for environmental remediation. Already, civil society in Indonesia is calling for cleaner energy solutions to be implemented across the archipelago. At present, most efforts toward environmental sustainability is targeted at Indonesia’s populous cities. The Jakarta grid is being improved, and subsea HVDC power lines are planned to connect Java and Sumatra using just the kind of subsea and terrestrial engineering needed for a Pan-Asian Energy Infrastructure. Bali is a major tourism area of Indonesia. It has become the focus of battles against dirty power and in favor of cleaner energy sources. At present, Bali relies upon dilapidated, 1970s-era coal-fired power plants to provide electricity to a world-class resort that draws tourists for its natural beauty. This has led to calls from Bali’s local government for future power supplies to come from cleaner energy sources such as solar. These supplies could be imported from Australia through a Pan-Asian Energy Infrastructure. The 1,000 MW Upper Cisokan Pumped Storage Project is shaping up as a key development in Indonesia’s shift toward clean energy. The pumped storage plant is supported by the World Bank, and will be able to bring online energy on short notice to help offset fluctuations in the Java-Bali grid. Similar projects located elsewhere in Southeast Asia (China is already building them) can provide a source of quick release load balancing power. Germany, for instance, is experimenting with using old coal mines as pumped storage locations for surplus wind power. While Indonesia works to deepen electrification throughout the archipelago, the government is already moving forward to deepen telecommunications links. The Palapa Ring project aims to connect all Indonesia’s advanced telecommunications. Already, Indonesia has laid down bits of the system off Kalimantan. Over time, Indonesia’s national phone company PLN wants to extend the system all the way to Darwin in Australia’s Northern Territory. At present, the system is expected to extend only as far as Kupang, West Timor. Connecting Australia and Indonesia in this way would deepen commercial ties between the two countries, a political objective of both governments. Indonesia’s current energy path is unsustainable. It is running out of oil and it burns alot of dirty coal. Within just a few years, Indonesia is expected to cease exporting oil, although it should remain a net exporter of natural gas. Separately, Indonesia’s coal use has made it one of the world’s worst greenhouse polluters. Meeting Indonesia’s goal of universal electrification by 2030 will require investment of $227 billion, or roughly 1.6% of Indonesian GDP per year between now and then. At present, this is clustered into a crash program to add 10,000 MW of capacity, with 60% of the capacity targeted for Java and Bali with the rest aimed at islands across the archipelago. As part of this, the government aims to raise the proportion of renewable energy from 4.5% to 17% of national consumption by 2025, focusing primarily on micro-hydro, biomass, geothermal and wind. One way of achieving this goal is to provide greater assurance to independent power producers that they can sell their output to the state energy monopoly PLN. In working to achieve this goal, Indonesia is being assisted by multilateral organizations such as the Asian Development Bank and World Bank to build out infrastructure, particularly in regional areas where unreliable power supplies make it difficult to attract industrial investment. Nonetheless, some international majors such as Chevron are involved in developing both geothermal and natural gas in the country, and regulatory certainty is improving. For instance, in one recent move, the government agreed to cover losses in geothermal developments. Similarly, multilateral institutions such as the Asian Development Bank are offering to help fill out the Indonesian grid as a means of encouraging economic activity. Indonesia and Malaysia are working to deepen interconnections between their grids on a bilateral basis. This would entail both exports and imports of electricity, which is what a progressively integrated Asian market should encourage. Outside the Mekong States, Malaysia and Indonesia are the countries best-suited to deepening interconnections in their electricity grids. For instance, Malaysia is considering investing in increased electricity connections to Indonesia to import power, and East Sumatra may eventually have surplus power. Furthermore, Indonesia and Malaysia’s demand profiles are different, with Malaysia’s peak energy needs occurring during the day, and Indonesia’s at night. Singapore is an energy-poor but services-rich island state. Given this, Singapore can play a key role as regional trans-shipment, managerial and trading hub in the geographic heart of Asia. Singapore has little in terms of renewable energy. Singapore does, however, have business skills and an established trading platform. Singapore can provide the managerial brainpower for a Pan-Asian Energy Infrastructure. Singapore could receive and dispatch electricity received from Australia and Indonesia. It could balance these against aggregated electricity demand in Malaysia, the Philippines and Brunei. Surplus electricity could then be shipped north to the Mekong States, while deficits could be met through imports of power. Singapore has played the role of Asia’s trading entrepot for centuries. It is ideally suited to this task in the area of energy. Singapore also is a logical location for a regional carbon trading center and regional natural gas spot market. This would serve to unify the Asian market, and create more accurate, pan-Asian price signals for investment. Singapore also could serve as the coordination center for strategic energy reserves for Asian economies located east of the geographically vulnerable Straits of Malacca. Similarly, Singapore could operate as a research center. That’s because as energy markets become increasingly interconnected, standby supplies of marginal power will be needed. This can be done through dispatching stored energy sources. One of these is hydrogen, an area Singapore has staked out for developing expertise. Singapore also could become a location for infrastructure repair work to be organized and tendered. Some efforts already are being taken along these lines in ASEAN to eliminate duplication. With hydropower, biomass and a central location, Malaysia is ideally suited to become one of Southeast Asia’s major players in a Pan-Asian Energy Infrastructure. Malaysia now satisfies about nine percent of its electricity needs from hydropower. Of that amount, 85% is generated on the island of Borneo. The centerpiece of Malaysian Borneo’s hydro power industry is the environmentally-controversial Bakun Dam. At 2,400MW capacity, Bakun is Southeast Asia’s largest single power project. It’s the first of several large hydro projects planned for Malaysian Borneo that could, over time, total 20,000MW. Originally, Borneo’s hydro power was to be transmitted across the shallow South China Sea to peninsular Malaysia via a 1,576-kilometer, 2,000 MW capacity HVDC cable link. But this plan has been sidelined by Malaysia’s industrial planners. They’re now keen to level Borneo’s rainforest to attract heavy industry to an isolated location with high logistics costs using the promise of cheap hydropower. The idea is known as the Sarawak Corridor of Renewable Energy (SCORE). Not surprisingly, China’s State Grid Corp. has shown interest in helping Malaysia build the infrastructure to exploit the hydro resource. While some international companies, like aluminium smelters, plan to move to Sarawak to take advantage of the cheap electricity, not enough have done so to date to soak up all the hydro power the island may be producing. This raises the possibility of a hydro electricity glut if capacity is built without industrial customers to use it on Borneo or power lines to transfer it to peninsular Malaysia. If Malaysia decides to export the power to peninsular Malaysia, Borneo’s hydropower could — over time — become a regional resource of rapid-response ‘load-balancing’ power for a Southeast Asian grid in which intermittent renewables plays a growing role through cross-border trading enabled by a Pan-Asian Energy Infrastructure. If Malaysia’s hydro power were added to that of other Southeast Asian countries (like Indonesia, Vietnam, Laos and Vietnam), it could provide a huge amount of ready capacity to offset intermittent renewable energy generation. There’s already movement in this direction. For instance, Malaysia and Indonesia are negotiating increased bilateral electricity trade. In doing so, both would gain. That’s because Malaysia’s peak energy occur during the day. Indonesia’s peak electricity needs are at night. Swapping power would enable both countries to avoid building expensive, largely idle domestic peaking power capacity. Instead, each could make use of the other’s spare off-peak capacity. At present, the 10-member Association of Southeast Asian Nations has developed the Trans-ASEAN Gas Pipeline project and its Trans-ASEAN Electricity Grid. The purpose of both is to fill out the regional grid and provide deeper energy interconnections between ASEAN’s members. Malaysia sits in the middle of this. Deepened interconnections with Indonesia can mark the first step toward realising the goal of a pan-ASEAN electricity grid. Biomass, particularly waste from Malaysia’s palm oil plantations, has potential to emerge as a significant energy resource over time for Malaysia. Malaysia satisfies one percent of its needs from biomass, mini-hydro and solid waste, a number it plans to raise to 5.5% by 2015. Malaysia has large amounts of natural gas. It is set to become a major natural gas exporter in coming years. One company, Distinct Objective, is planning to build a $50 billion Liquid Natural Gas pipeline from peninsular Malaysia to South Korea. Called the Trans-Oriental Gas Pipeline, it is expected to be commissioned as early as 2015. First, it would demonstrate the potential for moving large amounts of natural gas around the region by pipeline. Second, it would be laid through the South China and East China seas, providing a route similar to that which could be traversed by a Pan-Asian Energy Infrastructure. Third, it would traverse nearly the same route as the Southeast Asia Japan Cable, a fiber optics project. This would demonstrate the value of bundling. Malaysia shares the island of Borneo with tiny Brunei, a natural gas exporter. Both Malaysia and Brunei have been developing natural gas projects in the South China Sea and developing LNG facilities to export that gas to northeast Asia. But as Distinct Objective has showed with its plans to develop an LNG pipeline between peninsular Malaysia and South Korea, more futuristic means of transporting energy resources from producers to consumers in Asia could evolve over time. In the case of Malaysia and Brunei, that could include being a transit point on a delivery infrastructure stretching up through the Philippines and Taiwan en route to the East China Sea. The Mekong States (Thailand, Vietnam, Burma, Laos, Cambodia) have strong wind, hydro and biomass assets. These fit nicely into a Pan-Asian Energy Infrastructure. The Mekong States can serve as a conduit between Singapore, Malaysia, Indonesia and Australia and the major northeast Asian markets of China, Japan and South Korea. A Pan-Asian Energy Infrastructure could travel by land up through Thailand and Laos. Grid interconnections exist with China’s China Southern Power Grid Corp., China’s southern electricity utility. A small amount of cross-border trading already occurs between China Southern and the Mekong States. Wind is the Mekong state’s largest renewable energy resource. Vietnam is the key country, and may have up to 110,000MW of wind energy potential. That’s roughly twice Vietnam’s forecast needed electricity generating capacity in 2020, and amounts to nearly twice the combined wind resources of all the other Mekong states. The country already has wind farms all along its eastern coast and in the South China Sea. Vietnam’s wind represents a major resource both for the country and the region. The Mekong states also have significant hydro resources. The Mekong States get about 13% of their electricity from hydro, primarily the Mekong River. That percentage could rise in coming years. Nearly all of the Mekong states plan to build dams, collectively amounting to nearly 30,000MW of new capacity. China also plans as much as 15,000MW of new hydro capacity upstream of the Mekong States. If all these dams are built, it will make the 4,800-kilometer Mekong River one of the world’s most dammed rivers — with 140 dams either already in existence or planned. The Mekong River Basin Commission has urged greater regional coordination in building dam projects. The commission has warned, as have others, that excessive Mekong damming could lead to negative impacts on wildlife, agriculture and flood control. Already, some proposed dam projects are being targeted by environmentalists. Even so, at least some of these dams are going to be built, despite environmental impacts. If that occurs, these dams should at least be put to their highest economic use: providing ‘load-balancing’ to a regional grid increasingly dominated by intermittent renewable energy output. Doing so, however would require comprehensive cross-border HVDC infrastructure. Proposed dam building in the Mekong at present has much in common with hydraulic fracturing for natural gas supplies in the United States, Australia and China. Both are being presented as a panacea for meeting rising energy needs, but in reality present only a specious solution to going green. In the case of hydraulic fracturing, the risk of poisoning groundwater supplies that may be needed decades hence represents an intergenerational transfer of remediation risk. In the case of excessive dam building in the Mekong, environmental damage and ruined livelihoods may be the result for those that depend upon the rivers where the dams are built. This, in turn, represents a transfer of ‘welfare’ risk from private industry to government to meet the costs of economic dislocation of rural inhabitants. These could be extensive given that a series of dams have been proposed for the Mekong that stretch all the way from interior China down to just outside Ho Chi Minh City. If all of these were built, they could strangle the Mekong River, leading to unintended consequences ranging from worse floods to excessive siltation. In late 2011, Thai Solar Energy Co. switched on Southeast Asia’s first concentrating solar power (CSP) park, a 5MW parabolic trough northeast of Bangkok. Another 10MW plant is slated for construction nearby in the town of Suphan Buri. Another 15 CSP plants are planned for Thailand, which has some of Southeast Asia’s best resources for direct normal radiation. Leading Thai industrialists have called for a major expansion of solar power in the country, calling for a 100-fold increase in solar output in Thailand by 2020, or 2,500 MW. The Thai government is targeting 25% renewable energy by 2022. As this occurs, Thailand can supplement solar energy supplies fed into a Pan-Asian Energy Infrastructure from elsewhere, most notably Australia. In terms of solar energy, solar photovoltaics (PV) is likely to be more widely used in Southeast Asia than concentrating solar power. That’s because solar PV works better than CSP on the kinds of humid conditions typical of the region. One indication of this kind of interest in Thailand has been a plan by the US government to invest $250 million in solar projects in Thailand, many of which will be PV. In 2004, the Asia Pacific Energy Research Center (APERC) found large positive sums could be achieved through greater cross-border interconnection of regional electricity grids. APERC found that the economics of interconnection so compelling it concluded that half of the infrastructure costs of enhanced cross-border interconnection projects could be paid back through efficiency savings gained from cross-border electricity trading. Much of this could be achieved through deepening consultation between countries in the region regarding more extensive economic cooperation and interconnection. Already, this is happening. Vietnam has been a big purchaser of Chinese electricity, and Japan is also actively seeking to develop cooperative projects in the region. Malaysia, Thailand and Vietnam all have natural gas interests in the South China Sea and have built exploration and production platforms in the sea. This gas is sometimes used domestically or traded to other countries. If a Pan-Asian Energy Infrastructure passed through the Mekong States, interconnecting its electricity grids, a natural gas pipeline could be laid alongside. This would increase energy security through creating redundancy. That’s because the Straits of Malacca is a very constricted waterway. An accident or act of terrorism could cut off imports of Middle Eastern Liquid Natural Gas (LNG) critical to Asia. For their part, both Vietnam and Thailand are planning to build LNG facilities along their southern coastlines receive LNG from the Middle East. China is also funding an oil and gas pipeline between its southern city of Kunming and the Burmese port of Kyaukryu. This will provide China alternative access to Indian Ocean energy supplies that needn’t pass through the Straits of Malacca. Burma is now building a 12 billion cubic meter pipeline from its Indian Ocean Coast to China, which should be completed by 2013. China views this project as geopolitically necessary due to the chokepoint the Straits of Malacca has represented from its imports of Middle Eastern natural gas. The South China Sea is rich in gas, wind and, potentially, ocean thermal energy conversion. Throughout history the South China Sea has been a trade route for spices and other goods. In the last 25 years, it has become a major transit route for telecommmunications. In the future, it can use these telecommunications pahtways as the template for creating an interconnectedm cross border energy network across Asia connecting a series of South China Sea Joint Development Areas linked to an open-access,common-carrier Pan-Asian Energy Infrastructure. At this point, however, the South China Sea is a contentious thicket of overlapping territorial claims. One way to solve the escalating brinksmanship over these territorial claims is to create an energy development plan that requires cooperation. A Pan-Asian Energy Infrastructure — if it were built by sea — could traverse the shallow waters between the Indonesia island of Natuna and the province of Guangdong in southern China on its western side.It would traverse Borneo and the Philippines en route to Taiwan on the eastern side. This would enable exploitation of natural gas resources in the South China Sea over the short-term and future energy sources like methane hydrates and Ocean Thermal Energy Conversion over the long-term. Due to atmospheric circulation patterns, the South China Sea has good wind resources. Much of this can be developed in the shallow waters off Vietnam. Already, Vietnam plans a number of such wind farms in its nearshore water. The South China Sea could be an ideal location for ocean thermal energy conversion (OTEC). The sea is one of few places in the world where large temperature changes between surface and deep sea waters occur near population centers. Even so, OTEC remains an expensive technology. It needs significant further development. These deep waters also could offer the potential for finding other energy sources such as combustible ice ores. Most of the South China Sea lies within close proximity of coastlines. Nearly all of it less than 100 meters deep with a significant amount less than 50 meters. This makes laying subsea infrastructure much easier. Subsea fiber optic cables and natural gas pipelines criss-cross the South China Sea. It’s hardly terra incognita. A Pan-Asian Energy Infrastructure arriving in south China by sea would first cross Indonesia’s eastern archipelagic islands. It would then turn northward into the South China Sea where the sea becomes shallow around eastern Java. It would the travel north past the island of Natuna, onward to the Yacheng oil field and interconnect with the major energy port of Guangdong. A Pan-Asian Energy Infrastructure could help solve — or at least constructively contain — the nettlesome problem of conflicting territorial claims to the South China Sea. Territorial claims generally stem from jockeying over resources. Given this, multilaterally-agreed rules can create a positive sum outcome for all involved. At present brinksmanship prevails as individual countries seek unilateral advantage. This increases the risk of miscalculation and violence. For instance, China claims virtually the entire area. The Southeast Asian nations reject that ambit claim. Many of those lay their own claims to portions of the sea. These claims overlap. At best, this hinders investment in developing the sea’s oil, gas and renewable energy resources. At worst, it’s turning the South China Sea into an international flashpoint for conflict — possibly for World War III. With greater geopolitical certainty, the South China Sea’s resources could be shared to everyone’s benefit. The marketplace would arbitrate claims. Energy and resource security would be enhanced for all. All the littoral countries of the South China Sea now pay lip service to solving the problem peacefully. Little’s been done beyond that. The Philippines is a poor country rich in resources. At present, the Philippines gets nearly 17% of its electricity from geothermal energy. It could easily add wind and biomass to that tally. The Philippines also offers an alternate route through Taiwan to Northeast Asia for a Pan-Asian Energy Infrastructure. The Philippines has been producing geothermal energy since 1979. It’s the world’s second-largest producer of geothermal energy after the United States. Geothermal plants exist on Luzon, Negros, Mindanao and Leyte. The Philippines could both expand its geothermal energy production and build an intellectual property export industry. The Northern Philippines has wind and at least one company is developing wind farms in Ilocos Norte that could serve as a stepping stone toward building a series of wind farms in the islands between the northern Philippines and Taiwan. This, in turn, would open up the deep ocean waters of the area to Ocean Thermal Energy Conversion (OTEC) as well as to tidal and wave energy. With its many islands, the Philippines offers great potential for tidal energy. One project has been designed to capture the tidal energy flowing between the islands of Samar and Dalupiri in the San Bernardino Strait. A proposed first phase, 2,200MW tidal plant in the 2.5-kilometer wide strait would cost $2.8 billion. This would be followed by a three additional buildout phases resulting in a total capacity of 25,000 MW. That would be larger than China’s Three Gorges Dam. However, the ultimate price tag at $38 billion would be almost 75% higher than the Three Gorges Dam for a capacity less than 10% greater. This reflects the immaturity of tidal power. It’s a technology still in development. Prices can be expected to fall over time. However, few renewable energy sources offer the predictability of tidal power if it can be efficiently captured. The Philippines is surrounded by deep ocean trenches. These are ideal for development of Ocean Thermal Energy Conversion (OTEC). OTEC exploits the differences between deep sea and surface temperatures to create energy. A company called Deep Oceans Philippines plans to develop 36 OTEC sites around the Philippines, some of them coupling OTEC energy generation with solar and wind. A consortium led by State Grid Corp. of China has been operating the Philippine electricity grid since 2009 under a 25-year contract. State Grid has since gone on to make investments in Brazilian energy assets. State Grid aims to become a major world player in the energy industry. And in pursuing this aim, it couldn’t have chosen a harder market to prove itself in than the Philippines. Spread out, under-maintained and unreliable, the Philippine electricity grid needs major investment. In addition, the Philippines has Asia’s second-highest electricity prices after Japan. State Grid and its partners plan to invest $2 billion upgrading the Philippine grid in the four years to 2015. If this goes well for State Grid Corp. in the Philippines, State Grid will acquire important experience and credentials as a global supplier of electricity grid equipment and network management. These skills would be useful in running a Pan-Asian Energy Infrastructure and would benefit everyone. China is already building out its domestic electricity grid aggressively. In doing so, it has taken the world lead in developing next-generation Ultra-High Voltage Direct Current power line (UHVDC) technology. In a Pan-Asian Energy Infrastructure, China could become a major equipment supplier to the system. In this role, it would have a strong vested interest in ensuring problem-free operation. The Philippines can be see as an example of how a Pan-Asian Energy Infrastructure can effectively balance interests in the region between the individual nation states, China and the United States. On the one hand, the Philippines and China disagree over the status of the Spratly Islands. But on the other, the Philippines has turned over its most crucial bit of infrastructure — its electricity grid — to management by State Grid of China. Furthermore, Chinese investors are helping to build up the nation’s renewable energy industry. To add to the complexity, the Philippines is now increasing its defense cooperation with the United States as a means of counterbalancing China. On the surface, this looks confused. But underneath, it shows how things are changing for the better, creating new relationships where cooperation, not confrontation, is the sensible path.